Aplysia dactylomela mating chain. PHOTO: Alison Miller. 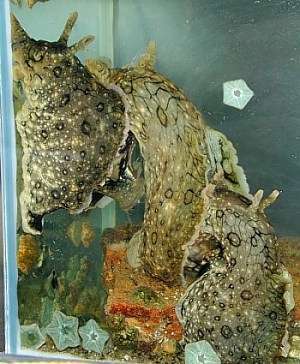 Sea Hares, like all sea slugs, are hermaphrodite animals with fully functional male and female reproductive organs. Sometimes, usually in dense populations or in crowded aquariums, they form mating chains of three or more animals, the one at the front acting solely as a female and the one at the rear solely as a male. The animal(s) in between are acting as both males and females. See also Michael Mrutzek's message [#8036] of a mating chain of the cephalaspidean Chelidonura livida, and Wannapa Thammasangwan's photo [#16512] of C. punctata.